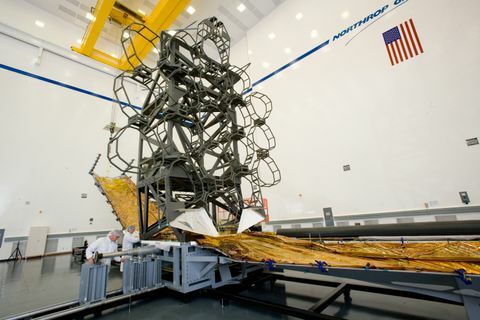 REDONDO BEACH, Calif., Sept. 22, 2009 -- The huge assembly standing in Northrop Grumman Corporation's (NYSE:NOC) high bay looks a lot like the James Webb Space Telescope (JWST), but it's a full-scale simulator of the space telescope's key elements. 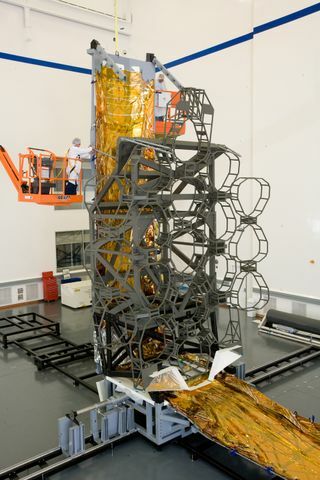 Engineers are using the simulator, consisting of the telescope's primary backplane assembly and the sunshield's integrated validation article, to develop the Webb Telescope's hardware design. In addition, technicians are using it to gain experience handling large elements in advance of working with the actual flight hardware. "Having a functioning demonstration article enables us to see how components, which were developed and tested individually, fit together as a whole system," said Martin Mohan, JWST program manager for Northrop Grumman Aerospace Systems sector. "The simulator is an effective risk reduction tool to help us validate design approaches early." John E. Decker, Deputy Associate Director for the Webb Telescope at NASA's Goddard Space Flight Center, said, "Simulators are important for the development of any spacecraft, and they are absolutely critical for one with the size and complexity of the Webb Telescope. We have already learned many important lessons from this simulator, and we expect to learn many more." The simulator is a key element in the company's extensive test and verification program, which relies on incremental verification, testing, and the use of crosschecks throughout the Webb Telescope's development. The goal is to ensure that the final end-to-end Observatory test is a confirmation of the expected results. Northrop Grumman's approach emulates its highly successful Chandra X-ray Observatory test and verification program. The company has conducted a variety of tests with the simulator, including checking the clearances between sunshield membranes and the telescope to evaluating membrane management hardware and simulating the backplane support structure's alignment measurements for future testing. Northrop Grumman is the prime contractor for the Webb Telescope, leading a design and development team under contract to NASA's Goddard Space Flight Center. Ball Aerospace & Technologies Corp. is the principal optical subcontractor to Northrop Grumman for the JWST program. ATK builds the telescope backplane and ITT develops the complex cryogenic metrology for optical testing. The James Webb Space Telescope is the next-generation premier space observatory, exploring deep space phenomena from distant galaxies to nearby planets and stars. The Webb Telescope will give scientists clues about the formation of the universe and the evolution of our own solar system, from the first light after the Big Bang to the formation of star systems capable of supporting life on planets like Earth.